Digitized by: Ted English, enhanced and formatted from original to one page. In his 85 years living on the Island, Jimmy Jones has seen it all. Yet, he says nothing can match the devastation of this year’s floods. 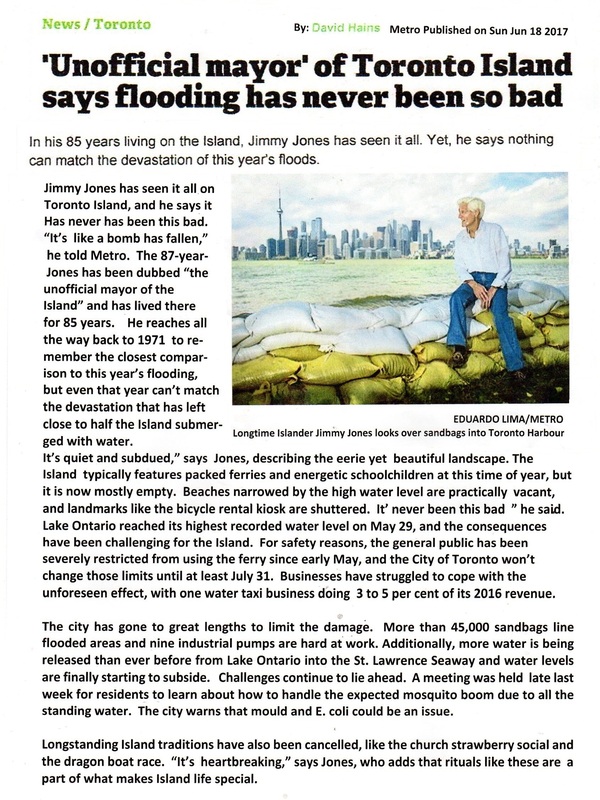 Jimmy Jones has seen it all on Toronto Island, and he says it’s never been this bad. “It’s like a bomb has fallen,” he told Metro. The 87-year-old Jones has been dubbed the “unofficial mayor of the Island” and has lived there for 85 years. He reaches all the way back to 1947 to remember the closest comparison to this summer’s flooding, but even that year can’t match the devastation that has left close to half the Island submerged with water. “It’s quiet and subdued,” says Jones, describing the eerie yet beautiful landscape. The Island typically features packed ferries and energetic schoolchildren at this time of year, but it is now mostly empty. Beaches narrowed by the high water level are practically vacant, and landmarks like the bicycle rental kiosk are shuttered. “It’s never been this bad,” he says. Lake Ontario reached its highest-ever recorded water level on May 29, and the consequences have been challenging for the Island. For safety reasons, the general public has been severely restricted from using the ferry since early May, and the City of Toronto won’t change those limits until at least July 31. Businesses have struggled to cope with the unforeseen event, with one water taxi business doing 3 to 5 per cent of its 2016 revenue. The city has gone to great lengths to limit the damage. More than 45,000 sandbags line flooded areas and nine industrial pumps are hard at work. Additionally, more water is being released than ever before from Lake Ontario into the St. Lawrence Seaway and water levels are finally starting to subside. Challenges continue to lie ahead. A meeting was held late last week for residents to learn about how to handle the expected mosquito boom due to all the standing water. The city also warns that mold mould and E. coli could be an issue. Longstanding Island traditions have also been cancelled, like the church strawberry social and the dragon boat race. “It’s heartbreaking,” says Jones, who adds that rituals like these are part of what makes Island life special.